An important focus of the PHO Performance Programme is to ensure that all children in New Zealand are receiving their necessary immunisations, by the recommended age milestones. A small proportion of children are not currently being immunised and it is important to identify the reasons for this and to find solutions to address this disparity. An important focus of the PPP for younger patients is to ensure that they are receiving their necessary immunisations, by the recommended age milestones. The PPP goal is for 85% or more of a PHOs enrolled population to have received their complete set of age appropriate vaccinations by their 2nd birthday. The overall national immunisation goal set by the Ministry of Health is for 95% of children in New Zealand to be fully immunised by age two years. Immunisation rates among children in New Zealand have been increasing over recent years. Latest data from the Ministry of Health shows that 85% of children in New Zealand that turned two between January and March 2010, had completed their age appropriate immunisations. Rates varied by DHB region, from 72% in Northland to 94% in Otago. The development of vaccines has been one of the greatest advancements in modern medicine. Rates of childhood illness have decreased substantially, morbidity and mortality has reduced and disease epidemics have become rare. Diseases such as smallpox have been eradicated (except in laboratory settings) and others such as polio and measles are likely to disappear over the next few decades. The chance of surviving childhood today is considerably greater than even fifty years ago. High coverage rates for child immunisation relies on the premise that parents are aware of; the threat of illness, that vaccinations exist, that their child needs to be immunised and that they can access appropriate services. This is not always the case. Even if the parent is aware that immunisation is necessary, not knowing where to go, inconvenient clinic hours, long waiting times and lack of personally appropriate services may all be barriers to receiving care. Immunisation schedules may be difficult to understand for some parents and they may be unclear as to what vaccines are necessary and at what time. Also consider that new immigrants may not always be aware that vaccinations are necessary as all vaccines are not routine in all countries. They may require assistance with understanding the healthcare system and the New Zealand immunisation schedule, which can be further complicated by language barriers. Cost is frequently a barrier to accessing services, especially in the high needs population. Visits to general practice for enrolled children under six may be subsidised or free in some practices, and vaccinations on the national immunisation schedule are funded. However, other costs may be incurred such as transport costs in getting to the practice, childcare costs and wages lost due to taking time off work. This may mean that taking a child for their vaccinations can become a low priority. Although immunisation rates among the high needs population are increasing at an encouraging rate, they are still lower than the total population in many areas and there is still progress to be made. Specifically targeting initiatives to Māori, Pacific people and those living in lower socioeconomic areas, helps to avoid increasing disparities. The National Immunisation Register is an electronic record of immunisation details of children in New Zealand. It was launched in 2004/2005 so data covers immunisations for children born from the launch date in their area onwards. It can be used by authorised health professionals to determine what vaccines a child has been given and when. This is especially useful if the child sees multiple providers or has moved. The register also records medical or personal reasons for not receiving a particular vaccine. Children are automatically enrolled at birth, but parents have the option of removing them from the register. Providers can access records from the register through their PMS or by phone. Vaccination information can be provided back to the register via the PMS or a paper-based system. Try to avoid viewing people as “hard to reach”, think of them instead as hard to find, unconvinced, uninformed, undecided or under-immunised. Consider ways in which your practice may be viewed as “hard to use” and ways in which these barriers can be addressed. Do you offer flexible clinic hours? Is your service child-friendly? Do you provide information in different languages? If a practice is unable to make contact with a child’s parents after repeated attempts, it may be possible that they will respond to a community outreach programme. However it should be clear that this is a “last resort” option as it is important that all efforts are made to get the child and their family re-engaged with general practice. A range of outreach services are available to increase immunisation rates among people who may have encountered barriers in accessing mainstream services. Services may be provided in community settings or in people’s homes. Contact your local immunisation co-ordinator, DHB or PHO for details of these services. Information about immunisations may be delivered by a variety of providers including midwives, Plunket, Māori and Pacific Well Child nurses, practice nurses, GPs, hospital vaccinators and outreach services. This may mean that parents are well targeted with information and opportunities to vaccinate their child, but it can also lead to fragmented care, contradictory information, delayed and missed immunisations. The number of different providers that may be involved in a young child’s care also increases the likelihood of incomplete immunisation records. It may be unclear as to who takes responsibility for providing recalls, following-up missed immunisations and ensuring that children are not “lost in the system”. As the quality of data in the National Immunisation Register is dependent on the quality of data received from providers, ensure that an accurate record of immunisation is recorded in the PMS, including any adverse reactions. Also record any reasons for vaccination refusal. Aim for uniformity in data entry within a practice. Parents receive a “Well Child” book for newborns, usually from the Plunket nurse. This contains information about the New Zealand immunisation schedule and a written record of vaccines that the child has received. It is important to encourage parents to use this book and to keep it up to date. The way in which maternity care is organised in New Zealand makes it difficult for general practices to sometimes even be aware that a patient has had a new baby. Often the first contact is when the parent brings the child in for their six-week old health check. Most hospitals and maternity facilities will inform a patient’s GP in writing, when she has a baby (if a GP is nominated). Consider using receipt of this letter as an opportunity to invite the mother to enrol the baby in the practice and provide information about immunisation. It is important to be aware if an infant is on a high risk immunisation schedule and requires extra protection from pneumococcal disease or is at risk of tuberculosis, e.g. a child with a medical problem or born to a mother who is hepatitis B positive. If a mother presents to the practice while pregnant, make sure immunisation is discussed and create an expectation that the child will be enrolled in the practice when born. Firstly establish which immunisations have been given and when (use the National Immunisation Register if necessary). A catch-up regimen can then be commenced based on the current age of the child. Immunisation catch-up schedules can be found in the 2008 National Immunisation Schedule Health Provider Booklet (Page 50). If a child has come from another country, find out what the immunisation schedule is for that country and check they have received those vaccines. It is important to check by antigen rather than vaccine, e.g. some countries use single measles and rubella vaccines therefore a child would need MMR as a catch up to provide mumps protection. If the child does not have a valid record of immunisation, start an age-appropriate catch-up programme based on vaccines on the New Zealand Immunisation Schedule. For details of immunisation schedules of other countries, contact your local immunisation co-ordinator/facilitator, medical officer of health or the Immunisation Advisory Centre (IMAC). In the course of a busy consultation it can be difficult to find time for preventive healthcare. Immunisation status is more likely to be checked at a well-child visit than a sick-child visit. Asking about immunisation status and actively following-up on children who have missed immunisations takes time, and is not always prioritised. Even if immunisation is discussed, there is often not enough time in one consultation to provide the level of information and reassurance needed in order for some parents to understand and realise the importance of immunisation and feel comfortable with the decision. Take every opportunity to ask about and encourage immunisation. Patients rely on information about vaccines from their general practice. When a young child attends for any reason, take the opportunity to check whether they have been immunised and discuss the reasons why, if they have not been. Validate a parents decision to immunise their child, emphasise both personal and community benefits and encourage them to encourage others. Some clinicians may find it difficult to stay current with the national immunisation schedule and newly available vaccines. Vaccinators are expected to be knowledgeable about indications, contraindications and adverse effects, as well as the risks of the diseases being vaccinated against. The benefits of vaccination must be explained, while acknowledging the rare chance of adverse effects.5 This can be endorsed with written resources e.g. brochures from the Ministry of Health. Anaphylactic reaction to chickens, including eggs, egg protein, feathers. Giving a live vaccine less than four weeks after another live vaccine (unless given on the same day) There is a theoretical risk that administering a live virus vaccine (e.g. MMR, varicella) within four weeks of another live virus vaccine, will result in a suboptimal immune response. This does not apply to live vaccines administered on the same day, which is acceptable. Allergy to vaccine components Provided there is no history of anaphylaxis, allergies to vaccine components, e.g. asthma following exposure to feathers, or a rash following consumption of eggs, should be treated as a precaution only. A longer period of observation following immunisation is recommended. Thrombocytopenia or history of thrombocytopenic purpura and MMR In most circumstances, the benefits of vaccination are greater than the potential risks and giving MMR is justified, particularly in view of the even greater risk of thrombocytopenia following measles or rubella. Haemophilia and related bleeding disorders Children with haemophilia and related bleeding disorders should be immunised. In some cases of severe haemophilia the vaccine can be given subcutaneously rather than intramuscularly. Prophylaxis should be given on the same day as the vaccine. Consult a haematologist for advice if required. Anti-vaccine lobby groups campaign strongly and can easily convince parents who lack balanced information, not to immunise their child. These groups claim that vaccines do not eradicate or significantly reduce disease (it is simply a coincidence) or that vaccines themselves cause disease (e.g. autism). Many of these groups also advocate homeopathic “vaccines” (water containing the “memory” of molecules), dangerously compromising the health of children. Listen to, and acknowledge, parents concerns about immunisation, provide clear and balanced information, respectfully correct any misinformation and build a trusting relationship. It may take several appointments before some parents are convinced or ready for their child to be immunised. Let parents take the time to feel prepared, do not rush them, encourage questions, let them have time to absorb the information. Parents may be unsure about how vaccinations are given and fear that it will cause undue pain and suffering for their child. Parents should be fully informed and involved in the vaccination process. Uncertainties and negative experiences shared with whānau and friends can cause this barrier to become widespread. To allay fears about vaccine administration show parents the needles and equipment for vaccination, explain what will happen and tell them they are welcome to bring a support person if they are likely to be upset by the vaccination procedure for their child. Parents often like to hold their child in the “cuddle” position during vaccination. Mothers may wish to breastfeed immediately afterwards and they should be supported to do so. Some parents prefer not to hold their child during vaccination, so if possible arrange an appointment when another practice staff member is able to assist. Explain that adverse effects are usually mild and transitory (Table 3). Make sure the parent knows that they will be required to wait at the surgery for at least 20 minutes after the vaccination for observation to ensure there is no severe allergic reaction. In the past some practitioners would use paracetamol prophylactically at the time of vaccination, however research now suggests that this may lessen the effectiveness of the vaccine.8 Therefore paracetamol is only recommended after vaccinations if distress from fever, pain or irritability occurs. See BPJ 25 (Dec, 2009). “Reconsider paracetamol use post-vaccination” for further information. The National Immunisation Schedule is now reviewed every three years by an expert advisory committee and changes are made as new, effective vaccines become available. The next schedule review is due in 2011. One of the main barriers to vaccination for some parents is the fear that the vaccine itself will cause harm to the child. This is despite the fact that the risk of adverse effects from vaccination is extremely low compared to the risks to the child if they contract the disease. Thiomersal (ethyl-mercury, also known as thimerosal) was used as a preservative in some older vaccines. There was concern expressed that the mercury exposure associated with receiving a thiomersal containing vaccine, would result in the development of autism. Multiple epidemiological studies have found no association between thiomersal and autistic-spectrum disorders. Modern vaccines contain either no thiomersal or only minute traces.5 All vaccines on the current New Zealand immunisation schedule are thiomersal free. Some people may have religious objections to using vaccines, e.g. concerns over the original viruses for some vaccines being grown in cell lines from aborted foetal tissues (single antigen rubella vaccine, MMR vaccine, single antigen chickenpox vaccine and Hepatitis A vaccines). However most religious leaders are of the view that the source of the cell line was not the choice of the parents and that the only viable option to protect their child and the community from these diseases is to use the vaccine.9 Parents should be encouraged to discuss any concerns with their religious leaders. For some cultures, visits to healthcare providers do not occur until there are symptoms, therefore protecting against a possible future occurrence of disease is not considered. Many also believe that prevention can be achieved through maintaining a good diet, achieving good spiritual balance and using traditional remedies that promote health. It is important to be respectful of cultural beliefs, but also to provide a balanced viewpoint on the importance and necessity of vaccination. Consider seeking the assistance of culturally specific healthcare providers. Some parents believe that vaccines are not natural and that it is much better for a child to contract a disease and subsequently become immune (e.g. chicken pox “parties”). Others may believe that they are able to control their child’s exposure to disease through environmental factors, therefore immunisation is unnecessary. In early 2010, the Lancet withdrew a 1998 observational study of eight children by Dr Andrew Wakefield and colleagues. The results of the study raised the hypothesis that there was a connection between the Measles, Mumps and Rubella (MMR) vaccine and autism and inflammatory bowel disease. Many subsequent studies on hundreds of thousands of children by other researchers failed to replicate the results. It was later determined that Wakefield had serious conflicts of interest and had allegedly “fixed” the results of the study, however by this time serious consequences had already occurred. Media attention from Dr Wakefield’s original hypothesis resulted in a significant decline in vaccination rates and a rise in the cases of measles among children in the United Kingdom, including at least four deaths. A child who is not vaccinated is being placed at undue risk of contracting a virus which can cause serious harm or even death. In addition, contracting a virus does not necessarily infer that the child will become immune. Parents may rely on the fact that the majority of other children are immunised to protect their own child. However, this simply increases the risk for everyone, by increasing the circulation of disease. Herd immunity occurs when a certain proportion of the population is vaccinated against a disease, significantly reducing the spread of that disease and consequently providing protection to unvaccinated people. The exact proportion of people needed to be vaccinated for herd immunity to occur is different depending on the disease, but is usually around 95%. Only a small proportion of people can remain unvaccinated to retain herd immunity in a population. This relies upon the majority of healthy individuals being vaccinated, thus protecting those who cannot receive vaccines due to serious medical conditions e.g. immune disorders and organ transplants are contraindications for live vaccines. In New Zealand, there continue to be outbreaks of diseases such as measles and pertussis. This is because herd immunity of the population is not sufficient, due to lack of vaccination in some communities. There are several vaccines available that are not currently part of the National Immunisation Schedule, but are available for purchase by parents. Varicella (chicken pox) and rotavirus vaccines are not presently funded, but are used in many other countries schedules and are predicted to be part of the New Zealand immunisation schedule in the future (although they will not be on the next schedule change in 2011). Meningococcal C vaccine, which is used in many other Western countries (as part of their immunisation schedules) is available for purchase in New Zealand. Travel vaccines such as hepatitis A may be given but check the age for licensure e.g. typhoid vaccine is not given under age two. Therefore, reasons to consider varicella vaccination include the potential risk of serious complications of the disease, and the subsequent risks to non-immune adults, particularly pregnant women and people who are immunocompromised. Varicella vaccination may be administered in children aged nine months to 13 years (single dose), who have not previously had the illness. It may be given at the same time as other vaccines including MMR, DTaP, hepatitis B and meningococcal C conjugate. Children aged 14 years or older and adults receive two doses of the vaccine. Immunocompromised children (e.g. undergoing treatment for cancer) cannot be given varicella vaccine as it is a live vaccine, however these children are at particularly high risk and it is important to offer vaccination to close contacts. As with all live vaccines, varicella vaccine is contraindicated during pregnancy and if not given simultaneously with other live vaccines e.g. MMR, it should be given at least four weeks apart. The cost of the vaccine is approximately $90 per dose. Tetravalent vaccines including measles, mumps, rubella and varicella (MMRV) are currently available overseas and are likely to be available in New Zealand within the next few years. Rotarix and RotaTeq are oral rotavirus vaccines currently available in New Zealand. The first dose is given between age six and fourteen weeks and the second dose given around four weeks later (but before age 24 weeks). The vaccine is administered orally, to the inside of the cheek, using an applicator. The dose may be repeated if the child spits or regurgitates most of the liquid. Rotavirus vaccine may be administered at the same time as DTaP, Hib, IPV, Hep B and pneumococcal conjugate (i.e. routine paediatric vaccines). Rotavirus vaccine does not protect against non-rotaviral gastroenteritis or diarrhoea due to other causes. The cost of the vaccine is approximately $140 per dose. Thank you to Dr Nikki Turner, Director Immunisation Advisory Centre, Senior Lecturer, Division of General Practice and Primary Health Care, University of Auckland and Barbara Warren, Otago Immunisation Coordinator, Southern DHB, for expert guidance in developing this article. Grant C, Turner N, York D, et al. 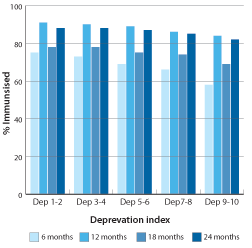 Factors associated with immunisation coverage and timeliness in New Zealand. Br J Gen Pract 2010;60(572):e113-20. Grant C, Roberts M, Scragg R, et al. Delayed immunisation and risk of pertussis in infants: unmatched case-control study. BMJ 2003;326(7394):852-3. Ministry of Health (MoH). 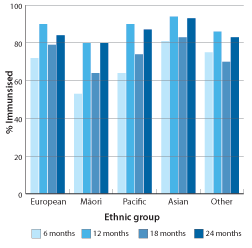 Immunisation coverage at milestone age: 1 January 2010 to 1 April 2010. Wellington: MoH, 2010. Burns H, Zimmerman R. Immunisation barriers and solutions. J Fam Prac 2005;54(1):S58-62. Kimmel S, Wolfe R. Communicating the benefits and risks of vaccines. J Fam Prac 2005;54(1):S51-7. Immunisation Advisory Centre. Contraindications and precautions to vaccination. Available from: www.immune.org.nz (Accessed June, 2010). Ministry of Health (MoH). Immunisation handbook. Wellington: Ministry of Health, 2008. Prymula R, Siegrist C, Chibek R et al. Effect on prophylactic paracetamol administration at time of vaccination on febrile reactions and antibody responses in children: two open-label, randomised controlled trials. Lancet 2009 Oct 17;374 (9698):1339-50. Chatterjee A, O’Keefe C. Current controversies in the USA regarding vaccine safety. Expert Rev Vaccines 2010;9(5):497-502. Immunisation Advisory Centre. Vaccine preventable diseases. Available from: www.immune.org.nz (Accessed June, 2010).